Hanging up his Junta Hat. Mod: For my money Pasadena is by far the most debauched city in this stretch of the San Gabriel Valley. And certainly in the thick of all that difficulty is the woefully administered Pasadena Police Department. Hopefully with this week's sudden resignation of PPD Chief Phillip Sanchez things will now begin to improve. But don't hold your breath. Today's double helping of coverage comes to us from Pasadena Black Pages, a news site that was first when it came to reporting on some of the things deeply troubling The Rotten Rose. 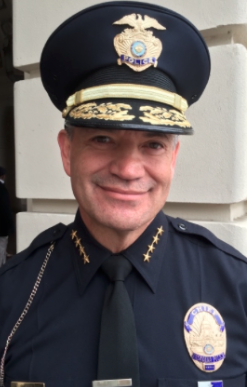 Pasadena Police Chief Sanchez Resigns Under Fire (Pasadena Black Pages link): The City of Pasadena was caught a little off guard this week when a letter of resignation suddenly showed up from Pasadena Police Chief Phillip Sanchez. The chief has been under scrutiny during the past couple of months since two of his officers badly beat Chris Ballew (link). This incident took place while plenty of the residents still had a bad taste in their mouths after prior incidents like when the PPD beat and killed Reginald Thomas in late 2016 (link). Shortly after that incident, a high ranking officer's home was raided by the ATF and over 100 guns and other armaments were confiscated (link). In February 2018, that same officer was indicted by the United States Government for the illegal selling of firearms. Just last week the news came out that another Pasadena officer is being investigated by the Feds for the same crime. Shortly after that, a video came out of one of the PPD officers involved in the Reginald Thomas incident refusing to answer any questions about the night they murdered Thomas (link). “The decision to step away from serving my community is a difficult one which took much deliberation and careful thought. For the past eight years, I have had the honor of leading one of the nation’s finest law enforcement agencies, comprised of heroic men and women who serve with distinction in keeping our city safe. Putting on the Pasadena police uniform every day has truly been a humbling experience,” Chief Phillip Sanchez said in a statement released by the Pasadena Police Department. Last week after a District 3 meeting where Pasadena Vice-Mayor John Kennedy and citizens expressed outrage at how things have been going with the police force, Chief Sanchez suspended the officers involved in the Chris Ballew incident, but he didn't fire them, leading to a lot of additional scrutiny (link). Perhaps he couldn't take the heat anymore and now he wants to turn his badge in. Who knows? But in the bigger picture don't be surprised if Sanchez indicted in the next few months. So much shady business has been going on in the Pasadena Police Department for so long, people are going to cooperate with the Feds to save themselves. Perhaps Sanchez didn't just step down because he's tired of hearing what the people are having to say, maybe the Feds are in his rearview mirror now. Could Indicted Pasadena Police Lt. Gourdikian Be A Reason For There Being So Many Guns On The Streets? (Pasadena Black Pages link): I was driving home from the Pasadena High School CIF basketball championship games, which the Bulldogs unfortunately lost, to the sound of a helicopter hovering over my neighborhood. After about twenty minutes I drove around the corner to the sight of police lights and caution tape. When I got there an independent videographer was on the scene and explained that someone had been shot. My interest was sparked because I knew the owner of the apartment, and my concern was for him. I made a few calls and found out that he was okay and the residences of the complex only heard the shots. By the time they came out the 39-year-old, ex-Pasadena resident (who now lives in Las Vegas), who had been shot was on lying the ground alone. Seeing the crime scene make me wonder if indicted Pasadena Police Lt. Gourdikian had anything to do with the gun used in this incident. In 2016 over 270 guns were confiscated in the City of Pasadena, and that doesn't include the over 100 guns now indicted Pasadena Police Lt. Vasken Gourdikian had stashed away in his Sierra Madre home. Around 250 of the guns were found in Northwest Pasadena. That is way too many guns to be in one community, especially when you think about how many of the guns that haven't been confiscated. We are necessarily concerned about gang violence and shootings. The Pasadena Police would like to make the people of this community believe that the gang problem is very intense in this city, but that's not necessarily the case. The gang shootings in December 2016 and January 2017 were aberrations, not the norm. But the fact that so many people have illegal guns is a problem. That we don't know yet if Lt. Gourdikian was selling illegally to the residents there is also a concern. We do know for a fact that he is under fire for selling guns illegally, according to his federal indictment. While Gourdikian was being investigated by the Feds, 8 men from Pasadena were coincidentally targeted and caught by the Pasadena Police heading to Duarte with over a dozen guns, allegedly to retaliate for the three killings. There is a possibility that the PPD has directly had their hand in a lot of violence in the city by playing both sides of the fence. If you make sure guns are on the streets, and you know where they are, you can make it seem like work is being done. But is this really just camouflage to keep the numbers right? The fact that Lt. Gourdikian was on paid leave after Pasadena Police Cheif Sanchez said he would deal with this differently, speaks volumes. They will always protect their own no matter what the circumstances. 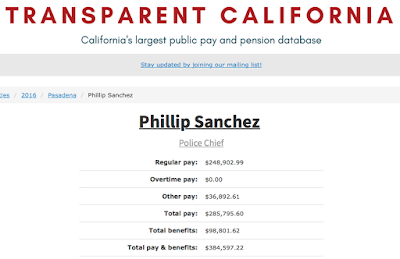 Mod: For the Transparent California numbers on former Chief Sanchez click here. Can we get Tornek to resign? Isn't that where the buck stops? Sanchez just won the lottery with the pension he will get maybe 200-300k every year for life with cost of living increases and free medical care. He's probably too young to retire so he will get another job to supplement his pension like they all do so that he will be pulling in more like 550k. All us taxpayers will have to work harder and retire later to pay for this. Pension for cops are outlandish. Even after they've been convicted for crimes, they continue to leech on taxpayers for the rest of their life. A person who has been law-abiding, are loyal private employees, or business owners don't get this kind of treatment. The law-breaking cops are no different from people who soak welfare. Remember Michael Carona? $212,332.19 per year. Does anyone know who the other cop on paid leave is? Have they given out his name yet? Oh great. They’ll just get another corrupt jerk to replace him. How much is the chief’s annual salary and benefits? Maybe over $300k, courtesy of taxpayers? Chief Sanchez then retires with lifetime pension, probably $200k+ yearly, FOR THE REST OF HIS LIFE. Taxpayers also forced to pay for the CalPERS pension scam that will one day go bankrupt if the cop unions don’t bully our politicians to keep funding all this crap. But trust me, every politician will cave into the PD unions’ demands. They all want to get re-elected and don’t have the balls or ovaries to stand up for what’s right. Just because a person wears a badge and gun, it doesn’t automatically make one a “hero.” I’ve stopped bootlicking/praising them for one. I’m beginning to think that law enforcement is more dangerous than the “criminals” that they are supposed to be apprehending. Founding Fathers knew what they were doing when they wrote first ten amendments — mostly to protect people from police and government. Hey 7:33, looks like you are getting pretty good wifi over there in County Jail. How long you in for and what were you convicted for? I think he does it with foil. 7:33, you are either a wanna be cop who didn't pack the gear to actually do their job, or someone who has made poor choices their whole life and is angry they kept getting caught. You have no clue what you are talking about. Time for relocation out of Pasadena. If you think the streets are gang ridden now, you ain't seen nothing yet. If you don't own a Saturday Night Special, it is time to make a purchase, legal or illegal. Pasadena appears to be headed back into the 80's;a very bad time to step outside ones house without getting shot, just because. There are two kinds of gang in Pasadena. The unsanctioned one, and the one on the city payroll. At least the unsanctioned ones rob taxpayers upfront. The ones on the city payroll do it with lack of transparency, under the pretense of "public safety." They rob under pretense of “public service,” not public safety. Jose Bencosme has a video up on his personal facebopok page visible only to his friends of a man stealing two Bencosme signs. Maybe they ran out of Charmin. Were these signs in Sierra Madre, or Arcadia? It's not the code enforcement officer removing signs that were illegally placed? Maybe the two guys were from city code enforcement and were picking up Andy signs that were illegally placed on city property? So Benco has secret content on his Facebook page that only special people get to see? My, isn't he one for transparency. Two guys stealing Andy signs? Really? I, for one, reported an illegal sign of his, was thanked by City Hall and told later that it had been removed. It reminds me of the Measure V time when Carol Canterbury was speaking before City Council against it, and kept turning around and telling the audience to be quiet and be more polite, even though no one was saying a word. Andy is running an issueless campaign, designed to appeal to people who know nothing. 7:33am. You must have voted for Jerry Brown, you have him to thank for CalPERS. CalPERS has been around for a while. Even back when there were Republican governors. Ha! Always have the camera rolling when you want to talk smack to the cops. Then make sure to put it on YouTube for all to see. Possible answer for over paid cops; here's hoping rents will really go up in Pasadena, then even the government subsidized housing will be unaffordable so that the families of low level offenders will be forced to move on, peacefully or otherwise. This would be the best compromise for the lack of living space for the millennial working population. Keep the streets safe in Pasadena, make the gangs work harder and from distant locations for that crime they will be committing. I take it you are a proponent of trickle-down economics? In South Africa it was known as apartheid. Take a look at Pasadena's white and non-white schools and tell me I'm wrong. 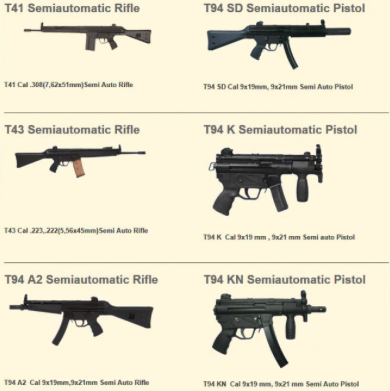 Chief Sanchez wrote the notes that allowed Gourdikian to purchase certain illegal weapons. He needs to go and spend some time in Club Fed as well. The weapons were not illegal for a peace officer to purchase. But Sanchez should have realized how many such letters he wrote for the good LT to bypass the 10-day waiting period that us common folk have to follow. It wasn't the guns that were illegal, it was the selling of those guns for a profit that was a no-no. Did Sanchez know Lt. Gourdikian was reselling them? 2) He was getting a cut. CalPERS became a failure when those clowns running this scheme in Sacramento, Ca. forgot who they were working for in the first place and wasted hard earned tax dollars being sent to them to invest and create a profitable return for all those retires. Instead these fools threw this money away on personal inspiration and financial gain for themselves. I might suggest Pasadena, Ca. look back at who left the PPD and why to get a idea which one of them they should contact and re-hire to replace the out going PPD chief, I might suggest one who left a few years ago and who is a female and now runs the GPD in Glendora, Ca. she would be a perfect fit. How many fake Twitter followers does Glendora PD have? I'm going to guess most of them are fake. Someone should do a public records request to see whether taxpayer money was used to buy fake Twitter followers. Also, checkout bottom of Yelp page. A lot of one-star reviews are censored in "currently not recommended" section. Did GPD have a part in censoring comments, thus violating First Amendment rights? New Glendora police chief appears to be Lisa Rosales. Interesting observation regarding Glendora police’s possible fake Twitter follows. Over 32,000 — but after scrolling down a bit, most are picture less with made up names, some foreign and some in oriental writing. Would even a police department stoop so low to buy fake followers though? Seems a bit North Korean propaganda-ish. I can only imagine the welfare for police has gotten even more onerous since 2011? Maybe it happens so much nowadays that the news doesn't even find it worthwhile to report? In spite of Glendora Police Department’s army of 30,000+ fake Twitter followers (as well as other social media shenanigans), has anyone actually looked into Glendora’s questionable compensation packages? Chief Stabb at over $272,000, Lt. Demond at over $259,000. Glendora is a smaller than Arcadia and has maybe half the revenue. Pasadena has about 2.5x more population and lots more revenue than Glendora. Yet the police salaries in Glendora are through the roof, not much different than Pasadena or even cities like Los Angeles or Beverly Hills. Something doesn’t seem right here. Who’s paying for all this?? 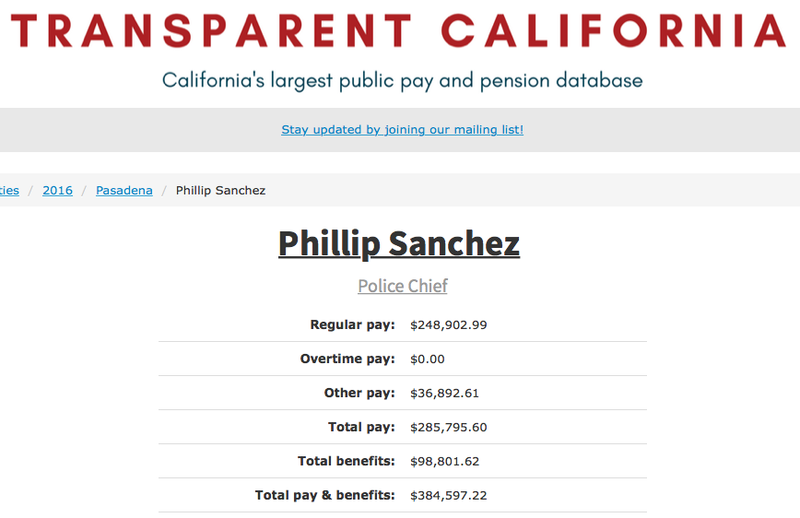 I Googled Glendora PD salaries and this blog mysteriously appeared. Had to scroll to the bottom (comments) to see why this page was indexed. Quick story: Was at Spaghetti Eddie's a few days ago and coincidentally they had one of those "tip a cop" scams. The chief was there, as well as two dozen or so of the PD's supporters. Out of curiosity I asked one of the cops if they were on the clock and she just pretended to be distracted, left, and didn't answer my question directly. Just had an interesting late night convo w/ some family and friends about how crooked the Glendora Police Department is becoming. Decided to Google it and this is what came up. Glendora Police (@Glendora_PD) has lots of fake twitter followers for sure. But is this the only news source that sort of covers this? Been Googling, hoping some other news agency covered it. But all I can find are these comments??? Is there some way to unite so we can protest against what's going on here in Glendora??? It sure seems that Chris Jeffers tried to fight the GPD union's demands, but Jeffers is run out of town because he was looking out after the city's best financial interests. Have the police become such corrupt sharks??? Then we have the outrageous parking "enforcement" rules. Gee-whiz -- all the parking tickets are probably used to pay each police officer's salary at $150,000+ to $280,000+. This pure insanity is largely being ignored. Long ago Glendora had a good police department. But as video camera phone and law enforcement transparency increases—and as people become more educated—I think and feel that they begin to open their eyes that not only is Glendora’s police department not as “good” as before; but these cops are getting more sleezy and corrupt (and yes, I’m referred to lack of police accountability and obscene pensions and salaries). Interesting comments nonetheless. Someone start a Glendora Tattler! 8:14am. California had Republican Governors? I don't count the body builder as a Republican. CalPERS written in its current form is new to the retirement system. Blame the Feds. Pasadena is a cesspool, let the Sheriffs have a go. Top Sherriff Lee Baca forced out on corruption too! Don’t forget Tanaka. Screw the corrupt sheriffs. All cops are dirty. Don’t be fooled. When the “good” cops fail to say and do nothing about the “few” bad apples, then they are much to blame. Thin blue line, remember? 6:40pm, you are a ridiculous cliche. "All cops are dirty" blah, blah, blah. "Thin blue line" blah, blah, blah. You sound like a bad movie. Why don't you stop believing everything you see on TV. Think for yourself and stop going along with the hipster "lets hate the cops" fashion trend. Or maybe the next time you need help call anyone but the police. You won't though, you'll call them, they'll solve your problem for you but you'll whine about how they do it. Grow up! @7:25: Of course I’ll call. They are public SERVANTS, remember? They swore to do a job without the expectation to entitlement of extreme salaries/benefits, preferential treatment, nor a perverse legal doctrine called “qualified immunity.” Anyway, keep licking those boots and drinking the Kool Aid. Maybe the aspartame will get you one day. Or maybe it won’t? Hmm.. speaking for myself, the cops always seem to come *after* the crime has been committed. I've had a $2,000+ Cannondale bike stolen, a $500 Dyson vacuum cleaner that I left outside my garage (for not more than an hour) stolen, a TI-89 calculator that I left on a coffee shop table stolen (was using restroom). Every time I get a police report done, the cops come to get a report written. Detectives took weeks to call me (and only after insistently following up, especially on the stolen bicycle case). Next day, the spare tire was suspiciously removed. This girl walked away from us when my friends and I had approached her to ask what the hell had happened the previous day. I told the principal, who said that we should work it out with her dad. To the dismay of our principal, we then called the police. Cop covered up for the girl, refusing to charge or even cite her. We later learned that the cop and principal were neighbors; their homes were across the street from one another. Eventually, my parents and I filed a lawsuit against her--and her dad settled the whole thing for 10k (her hit-and-run caused over $5k in damages to my BMW M3--which I worked hard to buy as my first car that replaced my 300k mileage 1980 Toyota with a hole in the floorboard). In the end, it was pretty sick how the cop covered up for the daughter. So yeah, I am going to guess that cops use their power to protect their own when accountability should be applied to everyone. Wow, you have had some bad luck with property being stolen. Maybe you should be a little more careful about where you leave your things. Vacuum left outside unattended? Bike stolen, was it locked up? I'll bet not. Leaving something of value on a coffee shop counter? I love how careless people blame the police when their things get stolen. Take some accountability for your action. It is so much more efficient to blame the victim. And much more self serving to blame others for your own foolish behavior. The calculator was left on a coffee shop *table* (not counter), along with my other books at the time (it was underneath a book, so the hooded man who took it actually made the effort to lift the book and take it). I was in the restroom for no more than two minutes. When I reported the lost calculator, the PD made it seem like a nuisance (implying that the loss of a $100+ calculator "isn't worth much")--and didn't even look at the surveillance camera footage until I insisted twice. When I called several weeks later, and finally spoke to the detective, he said he didn't even see or receive the footage (when the original report taking police said they will forward the footage to the detective). As for the bike, it was stolen from my car's bike rack. The bike was locked, with a key lock, to the bike rack. We're guessing whoever stole it used a bolt cutter? The vacuum was perhaps the most easily avoidable incident, as I was having carpet changed at my home and I was inside the home at the time. But given it's a good neighborhood, who would've thought?? Point is in all three incidents, the police never recovered my property. And when the woman hit-and-run into my BMW many years back, the police covered-up for the incident. I still remember the disturbing and dismissive attitude that the police gave for reporting the hit-and-run simply because he knew the principal and the perpetrator was the daughter of a Sheriff's sergeant. That's how the game is played! if one dollar was the amount, then law breakers such as Ballew would not scheme for a quick get rich joy ride throughout the streets angling for a meet & greet. Sorry dude. That is just nuts. Martial law. Sandbags and machine gun nests all around Pasadena City Hall. The Feds are closing in. 10:55am. Pasadena has White and Non White Schools? Then White Flight was just a lie? They flew, just not too far. Grammar Lady? Get the net. 1. Don’t spit your tobacco on the couch on the porch. 2. You’re going to be paroled soon. 3. Your mother was last seen at the truck pull. 4. The police came and arrested your father. 5. If you keep wearing that red MAGA hat, you’re going to stop even more blood from flowing to your brain. Now, does that tutorial help ? Off topic, but is Pr*sident Dennison’s failure to condemn Russia for trying to kill a former spy in Britain with a military nerve agent (WMD) a tacit approval for Russia to try to silence people in the US who may testify against the Putin/Trump junta? Just asking. 5:24pm. How do you know that you exist? I think you can tell by the trail of Fat Burger wrappers and Starbucks cups. Jose Bencosme landed mail today. It's postmarked in Arcadia. Under the list of scandals, you forgot to add the Pasadena PD helicopter crash. The crash happened in 2012, but video of it just came out a few days ago. Why did it take so long? Also, remember when the Pasadena PD officer didn't report what the USC Dean did because the two were allegedly tied?